This is Sarah’s little sister, Rachel. One thing that she and I have in common: We both love Halloween! And we both go all-out on creative, unique Halloween costumes for our children! One thing that we do not have in common: Sarah is extremely crafty and talented, and I am not. So while she usually sews her family’s Halloween costumes and creates everything from scratch, I usually buy everything and piece it all together. Hey, it works either way! Last year, Sarah asked me to write up the Easy No-Sew Ghost Costumes that I created for my children a couple of years ago. This year, she asked me to write up my latest Halloween creation: themed family costumes of How the Grinch Stole Christmas. Here we are last year in all of our Who-ville glory! As you can imagine, this was a super fun costume to create and wear!! The inspiration for this costume came from my one-year-old daughter, Sally. She is tiny and sweet, and I often call her “Sally Lou Who.” This got me thinking: Wouldn’t the Grinch be fun Halloween costumes?? Brown pipe cleaners for the Who antennas. I just wrapped these around my daughter’s little pink tails aand stuck them in the rubber bands and curled them with my fingers. Isn’t she the cutest “Sally Lou Who” you’ve ever seen?? 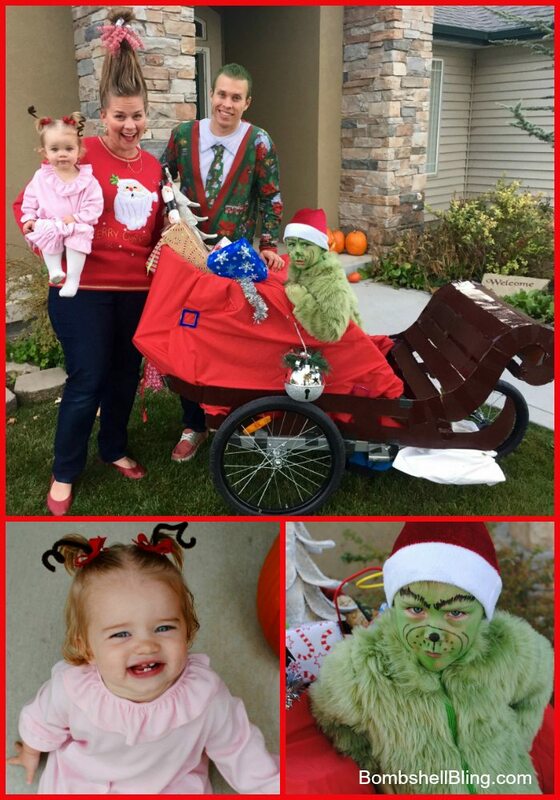 Definitely the cutest Grinch ever! He then taped the cardboard pieces onto the bike trailer, gathered some red fabric around the back to create the illusion of a big Grinch bag (I think he got this to stay on using Magformer magnets), and then we got out our Christmas decor and toys to make it look like the Grinch had indeed stolen Christmas. So fun! This sled was a major showstopper, but the family costume would still be very cute without it! So don’t let it stop you if you don’t have a creative spouse who is interested in spending hours creating something like this. My husband and I borrowed “ugly” Christmas sweaters from our friends. You can also search thrift stores or secondhand teacher-supply stores for these. This was definitely a costume and a night to remember! And the best part? We got to use the photo from Halloween for a super memorable Christmas card! Double whammy! I created the card on Shutterfly, and our friends and family loved it! I also used Shutterfly to create photo ornaments for our tree and the grandparents’ tree, using photos of the kids in their costumes. And the fun isn’t over yet. Because I’m slightly insane, I went so far as to create a reproduction of the entire How the Grinch Stole Christmas book as a unique gift for the grandparents. Yes, we took photos of our kids reenacting the entire story! Ha! But the Grinch who lived just north of Who-ville did not! This costume was an investment to create, but it was worth it–especially because we got to use it for a memorable Christmas card and unique Christmas presents for our family! I love these two little characters, and I’m so glad that they had a fun Halloween together. Let us know in the comments if you decide to use this idea for your family Halloween costumes! We’d love to see photos! Adorable children. I love all the costumes. OMG LOVE THIS! 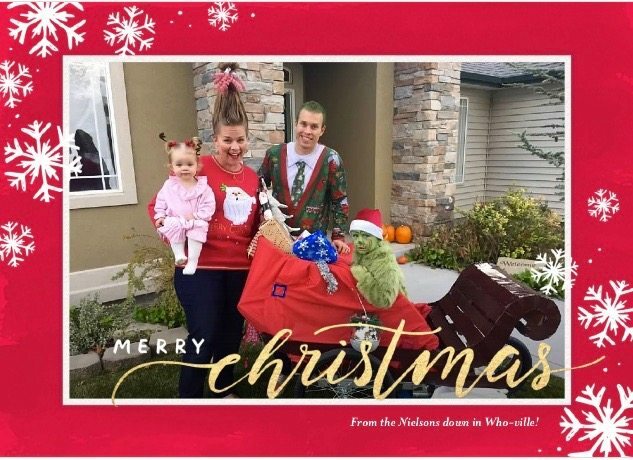 The Grinch is one of my favorite holiday movies – and your hair is amazing to boot. Great job that is certainly one for the books! Thanks for sharing this, found you at Turn It Up! This is fab! We are a bit more low key here in the UK with Halloween so family costumes are not really a thing much. My kids dressed up when they were little bit I just put my coat on and stayed at the end of the drive making sure they didn’t get kidnaped! I’m SO wishing we had this around as a “thing” though – so much fun. Your hair is brilliant btw, a plastic bottle – genius! What a fabulous costume and Christmas card idea. Your kids are perfect for Cindy Lou Who and The Grinch! Thanks for sharing with our Pretty Pintastic Party and I hope you will linkup with our Small Victories Sunday Linkup going on all week long! Oh my goodness, this looks amazing! What a beautiful (and original) Christmas card! Thanks for linking up this adorable family costume idea to The Pretty Pintastic Party! We loved it so much we will be featuring it at the party this weekend. We hope you’ll stop by, grab a featured badge, and link up more great posts! Without a doubt one of the cutest Halloweed themes I have ever seen. The grinch is perfect. And your hair; Wow! You did a wonderful job! Oh my gosh so awesome! & cindy lou is adorable!!! Thanks for sharing at the #InspirationSpotlight party. See you again soon. Pinned & Shared. Woah! Looks like you guys had a great time. You guys worked so hard for all this makeup. Love the fun and energy.